Lois Pollock writes: During a 2005 visit I traveled for the first time to North Eastern Uganda, where I was introduced to Dr Denis Omiat at the only medical clinic around, and for a couple of days I observed him as he worked. I was very impressed not only by his medical skills and creative, lateral approach to problems, but also by his respectful attitude in communication with his patients. One morning, while visiting the ward, we paused by the bed of a middle aged man who at time of admission was dying from cerebral malaria. Dr Denis had administered the recommended dose of treatment but saw no improvement in the man's condition. Fearing that he would die, he took a decision to infuse a combination of anti-malarial drugs into the patient's blood stream. Twenty four hours later, the doctor noted a marked improvement and by the time I was introduced to the patient, he was almost ready for discharge. Denis told me he was often in situations where, confronted with critically ill patients, he had to make clinical decisions that did not always conform to written protocols. 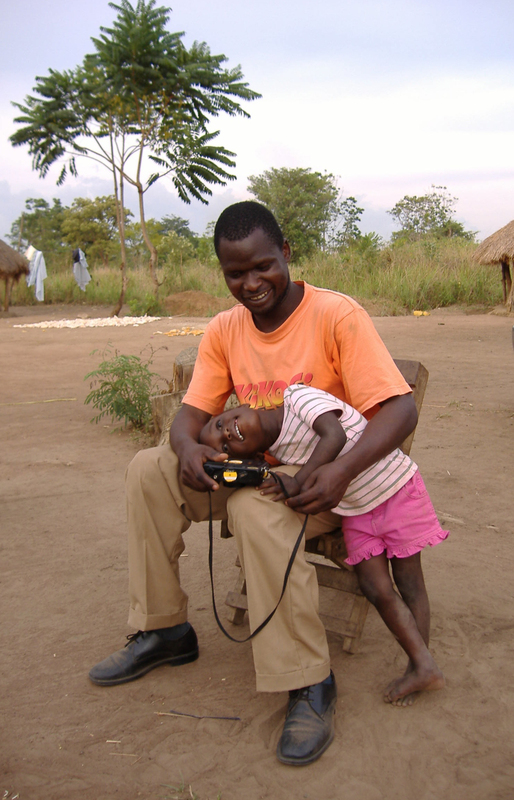 Perhaps this is not so unusual in any medical setting, but in a rural clinic in Uganda it appeared to me to be an enormous responsibility for the lone practitioner to take – the more so when Denis explained that although known as ‘Doctor’, he in fact was a Clinical Officer – roughly equivalent to a para-medic. The only son of a single parent, Denis was one of several siblings. His mother is a primary school teacher, a dignified, gentle woman of quiet bearing aged sixty four. She regarded learning as of utmost importance for all her children and I felt admiration for her in somehow putting each of them through secondary and tertiary education. External circumstances interrupted Denis' schooling for one year when he was ten or eleven. Several miles from his home village, the region was scarred for many years by insurgency, the roots of which are complex and puzzling for a Westerner to understand. "If you ask anyone in the Teso region when things got bad they would say that it was "the time of the Karamojong". In 1986 warriors from Karamoja started looting cattle from the Teso region. The raiding began in the north-east spreading gradually south and west towards Soroti, Katine and Kumi. It destroyed what remained of the region's economy. The raiding involved the burning of huts, the theft of ploughs and hoes, and the looting of stores of grain and flour. Once prosperous homes with more than 100 cows were reduced to ash. Those who could fled to the towns. But most remained in the villages where they had to contend with repeated raids and attacks." Denis recounted how as a young child, the Karamojong had raided his village repeatedly and he would run into the bush and hide out for days and weeks at a time, afraid to return home until he was sure the raiders had moved on. In total, he spent a year evading the Karamojong, sometimes running separate from his mother and siblings and uncertain until he found them later, what their fate had been. On one occasion, coming back to the village from the bush, he found the huts had been burned to the ground and an uncle shot dead. In Serere, where I first met Denis, he took me to a displaced person's camp on the edge of the town where dire health conditions resulted in malaria, dysentery, HIV/AIDS – all diseases he was dealing with daily in the clinic. He visited the camp regularly, encouraging the impoverished and hungry people to attend the clinic and be tested for malaria for which they could receive free treatment. Denis demonstrated enormous compassion toward people less fortunate than himself, doing so in a quiet, unaffected way that drew people to him. Denis told me that he had wanted to become an eye specialist, impressed as he had been by the number of preventable eye diseases that abound in the rural areas of Uganda. Alas, this could only be an ambitious dream since he had not had the opportunity to complete a medical degree. During the time I spent with him, I was beginning to consider the possibility that with a bit of careful financial planning and saving on my part, I might be able to offer him the chance of full time medical training: I was a little naive in thinking that with his clinical officer training and obvious field experience, akin to something like that of a bare-foot doctor, he would be able to enter medical school at least at third year entry! From London and after further consideration (and a bit of calculation on the 'back of an envelope') I wrote an email to Denis offering to pay his fees should he want to go to medical school. Some months later, he secured a place at Kampala International University (KIU) in the School of Medical Science and not long after, he moved from his village to commence his studies – right back in the first year of a five and half year course that stretched to seven years. In November 2013 he qualified with Bachelor of Medicine and Bachelor Surgery (MBChB). It has not been easy for me, as costs escalated and I ended up paying for his school fees, accommodation in Halls of Residence (desirable for safety reasons), and all his required text books in the early years that were unavailable online. Generous donors in Australia contributed the cost of a microscope and one year of tuition fees and I bought a second-hand computer that I replaced in 2009 with a new large screen laptop, external modem and the first month of internet connection. Denis experienced the hardship of being many hundreds of miles from his home and family and undertaking formal studies, some of which subjects pushed him to the limits. I never doubted his intention once qualified to remain a doctor in Uganda and a few months into his intern year at Masaka Regional hospital, he told me that he had been listed as the top surgical Intern doctor for the whole of Uganda - an enormous credit to his hard work and commitment! Denis will return to Ojama/Serere in late April 2014. He will be forced to take a doctoring job either in an NGO or a government hospital, while at the same time building up the services of Ojama Medical Centre. As funds become available the plan is to construct a maternity unit on land behind the clinic, so that it will become more likely that he will be able to make a living and the maternity unit is able to be constructed on the land behind the clinic, it will become more likely in the future that he will be able to make a living from full time work as the doctor for up to 7,500 residents of Ojama. Dr Omiat's wife Catherine has a diploma in ultrasound imaging that she is hoping to convert to a bachelor's degree in Diagnostic Ultrasound Imaging through a three year course at Ernest Cook Ultrasound Research & Education Institute, Kampala. You can read about Catherine and how you can support her HERE.